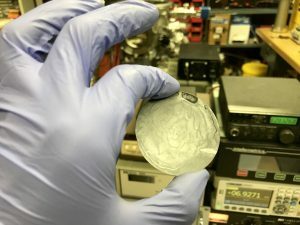 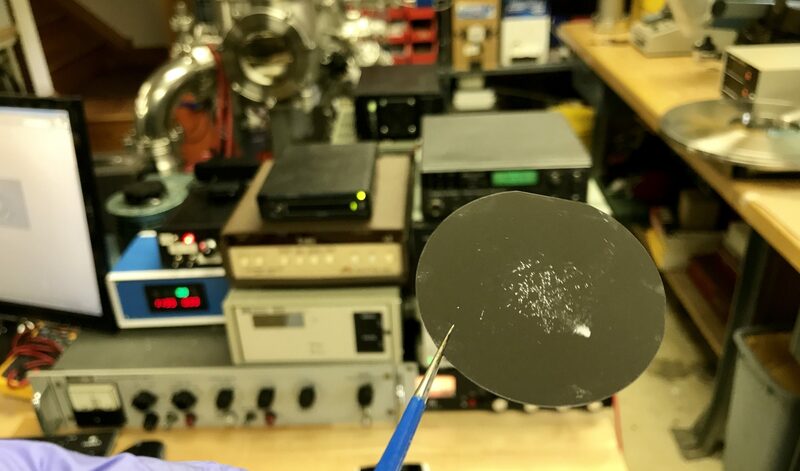 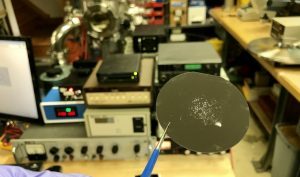 RF or DC oxygen plasmas are composed of a number of highly energetic and reactive species that will readily clean most organics off wafers and strip photoresist. 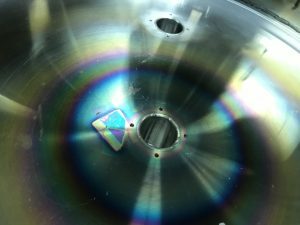 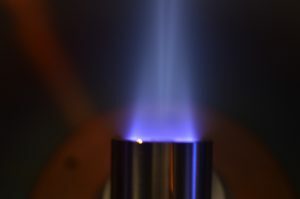 While operating with prolonged high power plasmas residual gas deposition and chamber sputtering collects on most surfaces. 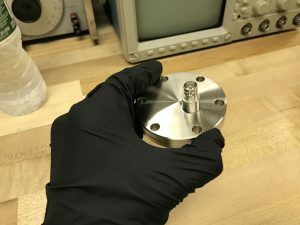 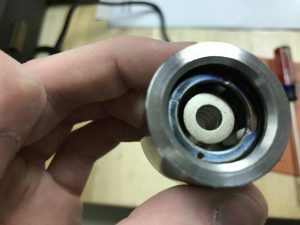 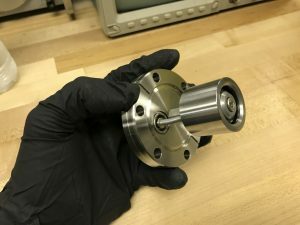 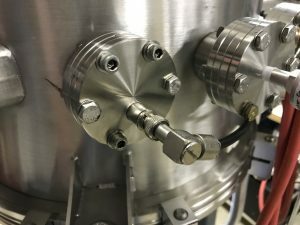 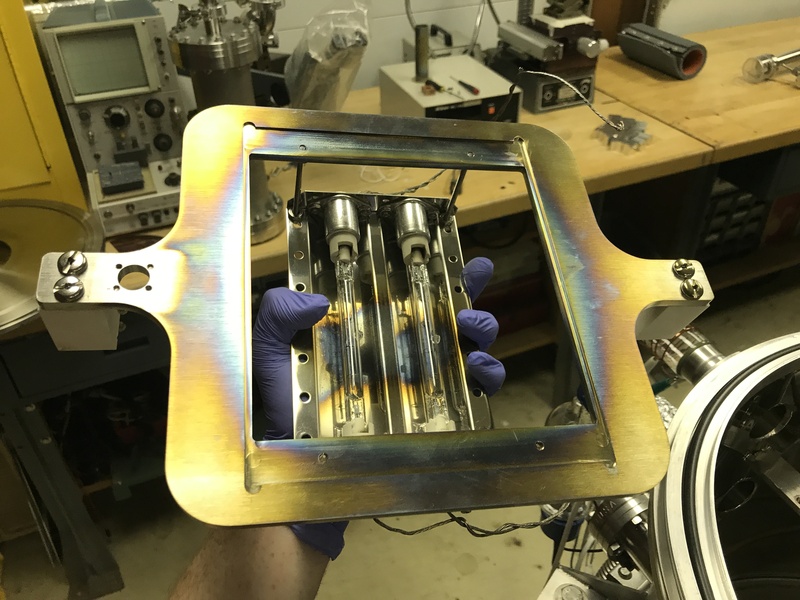 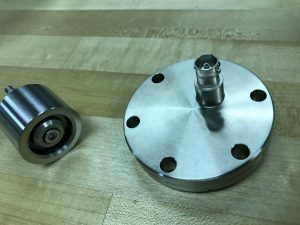 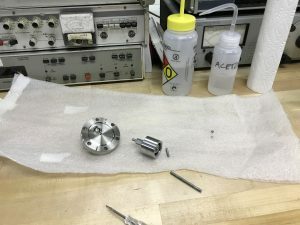 A simple Inductively Coupled Ion Source can be made by using a negative bias on an extractor cone or electrode to attract the positive ions and can later be focused into a beam with magnets. 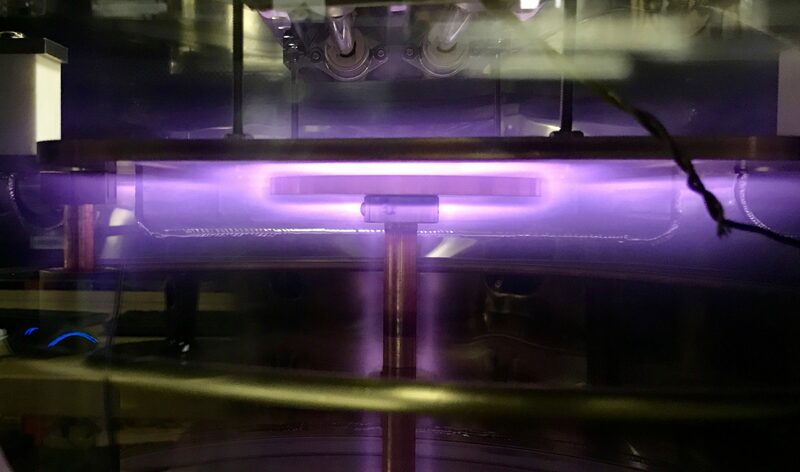 Such a source is suitable at high powers as a Deuteron source for an IEC fusor or for processes such as ion beam deposition or directional plasma cleaning. 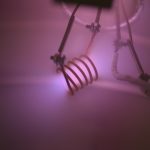 As seen in Patent #4,793,961, these architectures have been proven for exceptional use as hydrogen or deuterium ion sources. 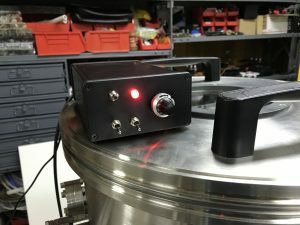 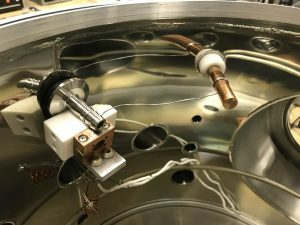 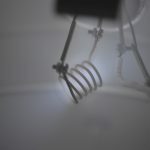 The ICP coil is placed on a quartz tube mounted via a Kovar KF40 flange to the vacuum chamber and an antenna tuner (matching network) is used to couple the RF energy from 10 meter Ham radio transmitter to the coil. 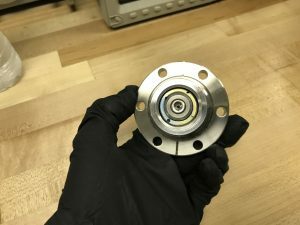 A Multi-cusp Magnetic assembly could be used as shown below to keep energetic electrons from being lost into the ion source walls, confine their motion, and reduce the occurrence of electron-ion recombination. 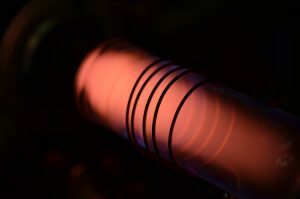 A high (low) negative voltage (usually between -400v and -2kv) is used on the extractor electrode. 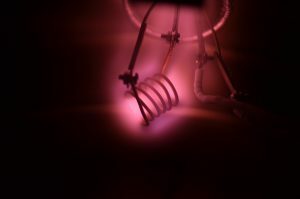 If this design was implemented in an IEC fusor, the extractor could be grounded because the fusor grid is held at a negative potential. 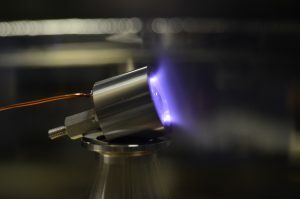 Fluorescence was observed in the quartz tube during these experiments due to electron bombardment. 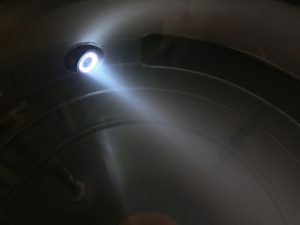 While the chamber was pumped down and MFCs setup, a DC copper sputtering environment was created for testing purposes as well as a controlled and isolated anode glow region of an incomplete glow discharge which forms a spherical region above the copper plate (anode) and could be used for uniform plasma cleaning. 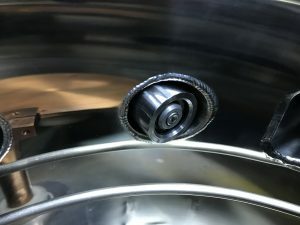 Due to different gasses pumping out of chambers at different rates (i.e. 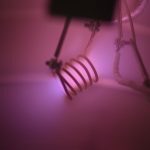 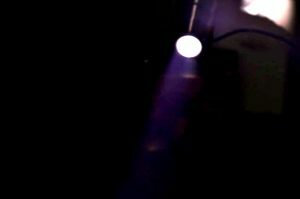 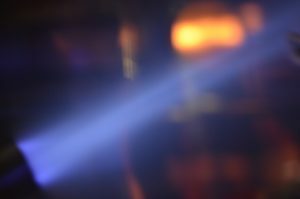 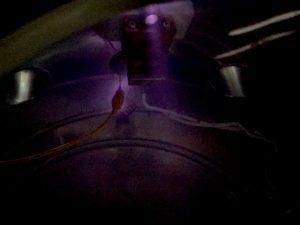 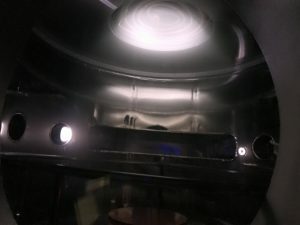 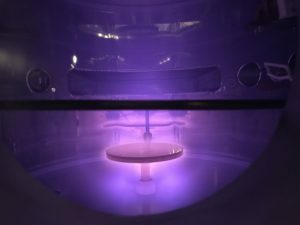 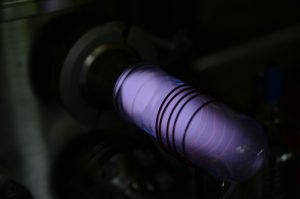 Hydrogen always has a low pumping speed) and air’s natural composition changing glow discharge colors can be observed while pumping down a vacuum chamber. 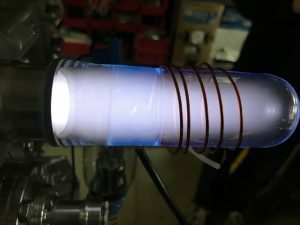 This was an attempt to estimate the pressure of the chamber indirectly during a pump down by observing and analyzing the inductively coupled plasma color at constant RF voltage. 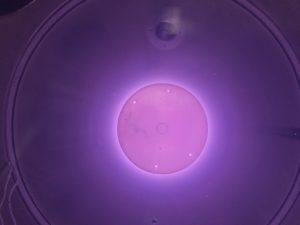 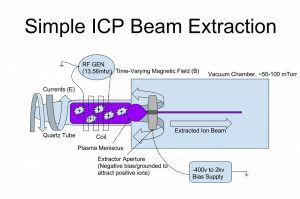 Inductively coupled plasma (ICP) is a common method of ionizing the residual gas in a vacuum chamber. 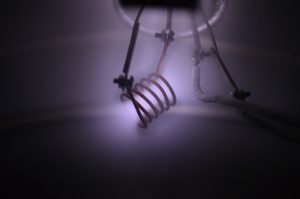 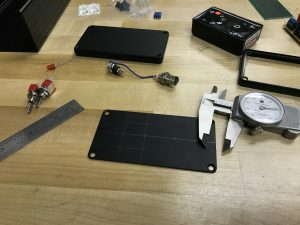 A RF source (commonly 13.56mhz) is connected to a coil (usually outside of the chamber) which induces currents in the nearby gas volume because of the time-varying magnetic fields. 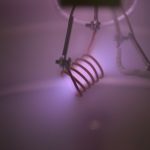 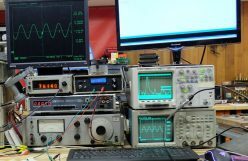 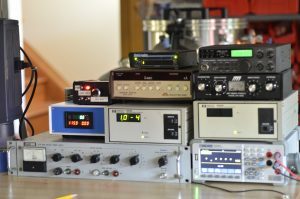 I used a 10 meter (28mhz) 100 watt ham radio transmitter at 60mTorr with multiple coil designs to create an inductively coupled plasma. 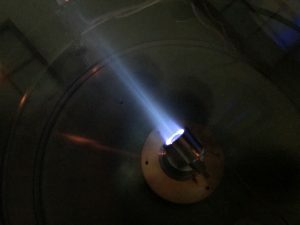 Even while minimizing the reflected power with a matching network (antenna tuner) the plasma was difficult to ignite. 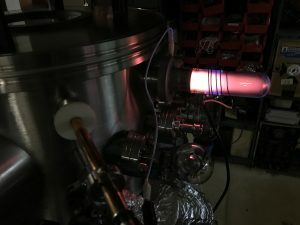 By briefly powering an anode layer ion source in proximity to the ICP coil I was able to ignite and sustain the ICP at lower power levels. 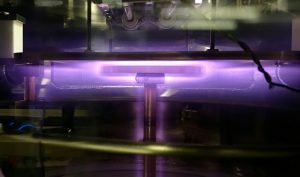 Once the ICP is sustained, the ALIS is powered off and the RF ICP remains on. 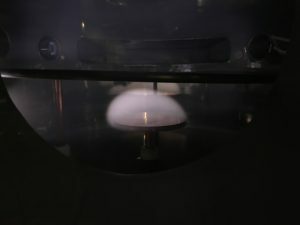 Preliminary testing of the anode layer ion source (ALIS) from RTFtechnologies. 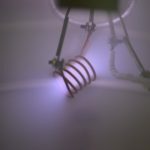 Tests were run at 50millitorr and between 800-1000v. 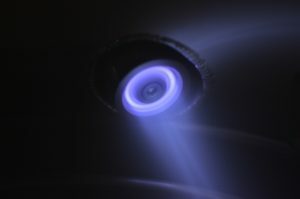 Air plasma can been seen as low as 300v. 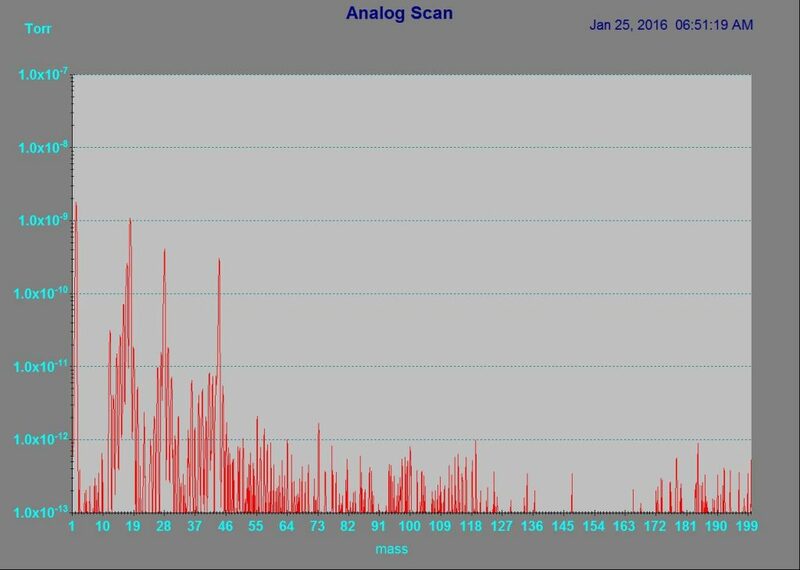 Typical current at 1kv is 4ma. 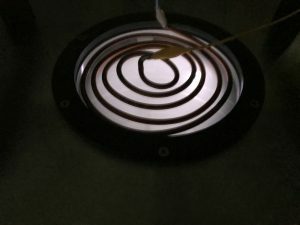 When the source is current limited, you can see a de-focusing effect as seen in the 2nd picture. 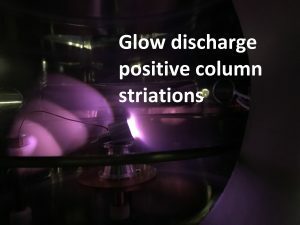 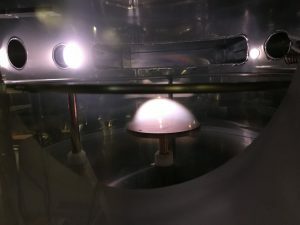 This is because the ion source is not operating through the closed drift mechanism but is rather operating closer to a modified glow discharge under the influence of a local magnetic field. 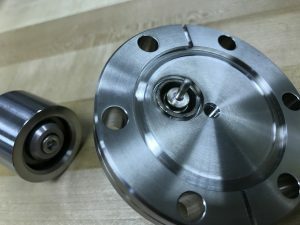 ALIS mounted on 2.75″ CF flange via 10-32 standoff and electrical connection via MHV connector. 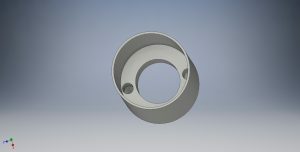 As suggested and fabricated by J.D Guerard machining Co., a ditch was formed around the hole drilled for MHV feedthrough on the interior side of the flange which created a wall matching in thickness to the MHV connector feedthrough to facilitate with fusing. 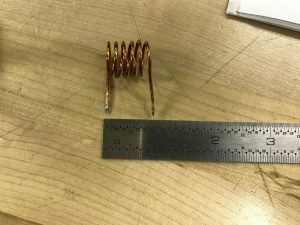 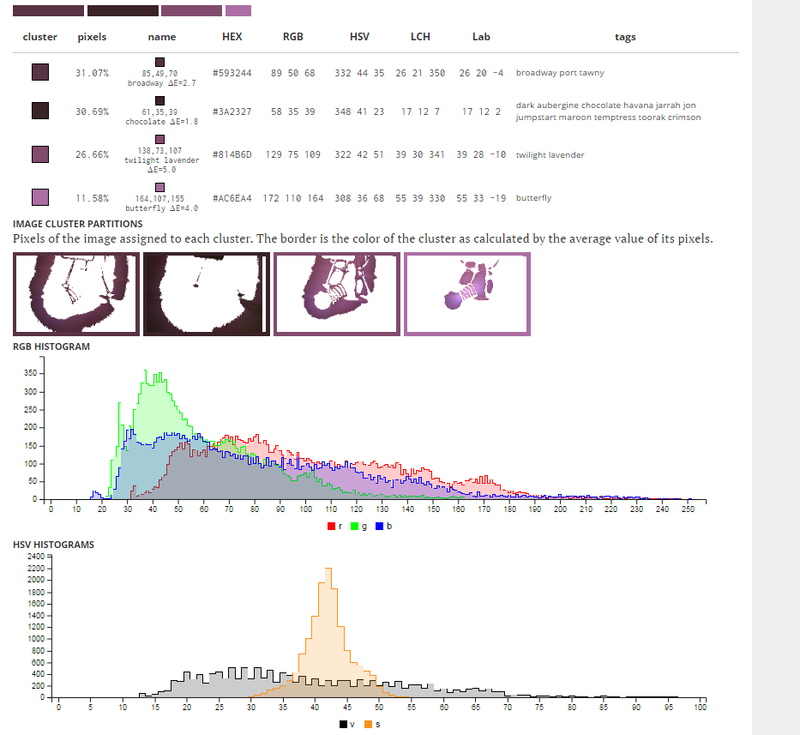 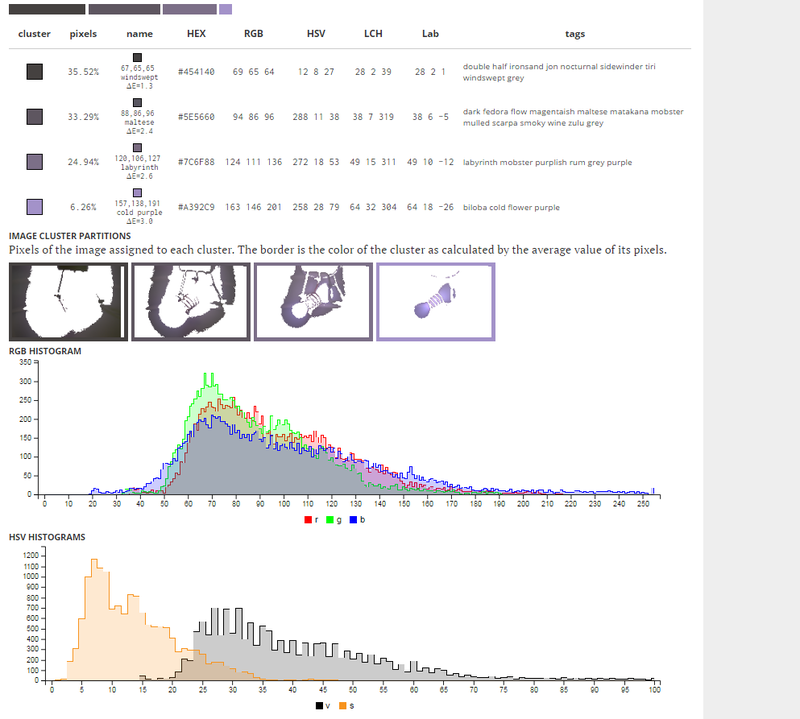 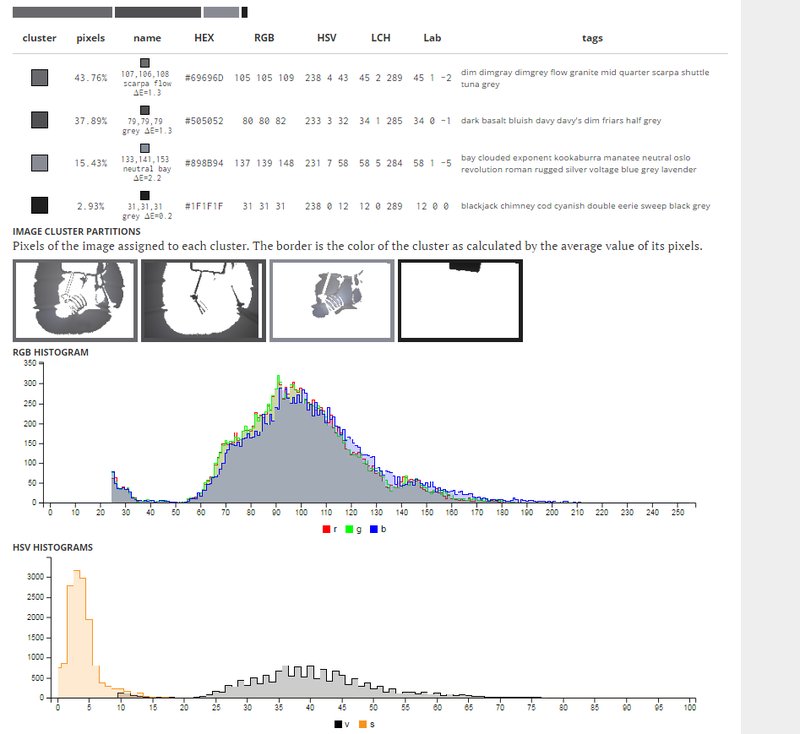 This can be seen in the first picture. When welded, the two surfaces of identical thickness are fused together easier, with lower current (this weld was done at only 20amps), and with consequently with no warping of the entire flange because of the localized heat. 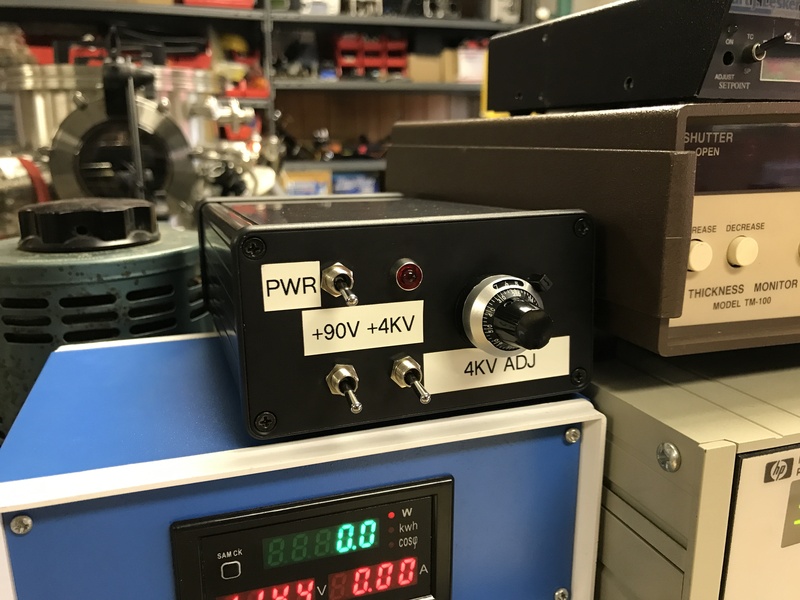 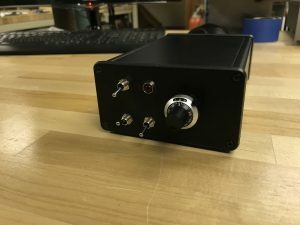 I made this dual high voltage power supply for an ion source (0-4kv) and also to bias the collector in a Faraday cup to remove secondary electrons from measurement (0-350v, typically 90v). 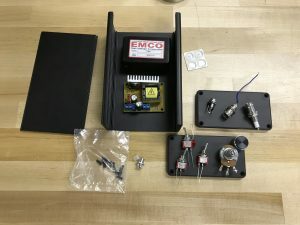 There are 2 boost converters for the high voltage and one buck converter to power the 0-4kv boost, which is an Emco F40. 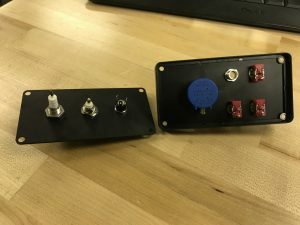 It can provide 4kv @ 2ma and is connected to the MHV connector on the back panel. 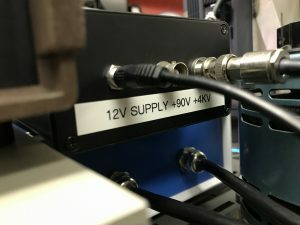 The Faraday Cup bias supply outputs through the BNC, and the main power connector is a 12v in through the barrel jack. 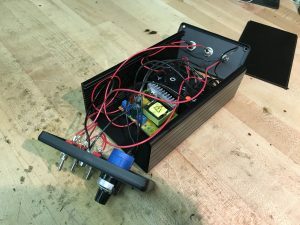 There is a 10 turn potentiometer on the front panel with locking knob for precise adjustment of the high voltage. 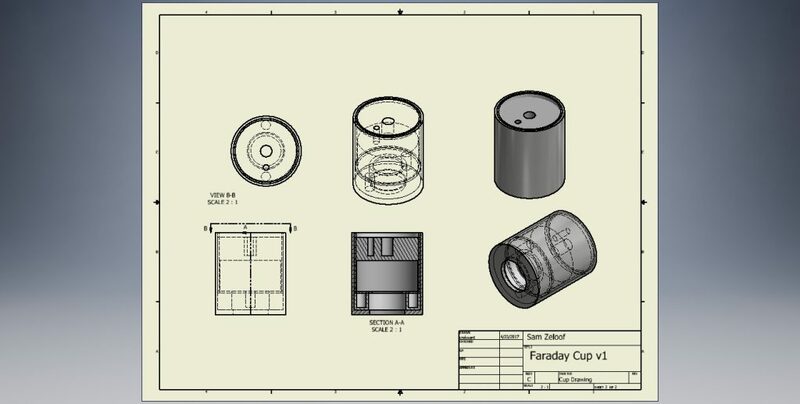 A Faraday cup is an instrument that can be used to measure ion beam currents. 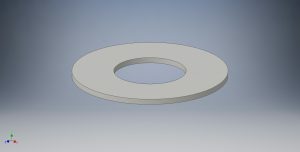 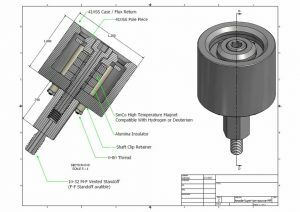 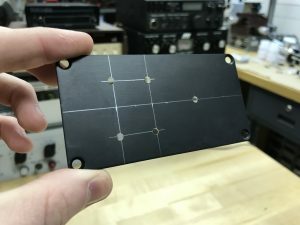 I designed this one for testing the anode layer ion source from rtftechnologies.org. 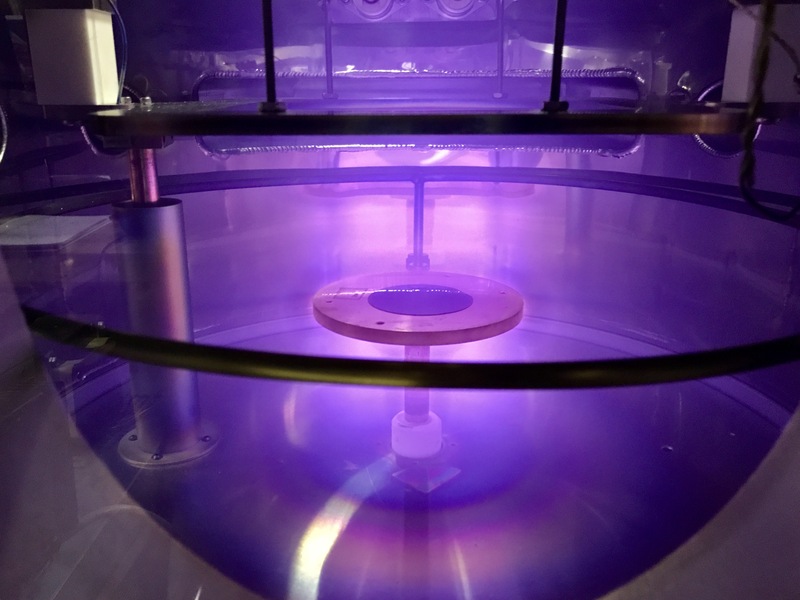 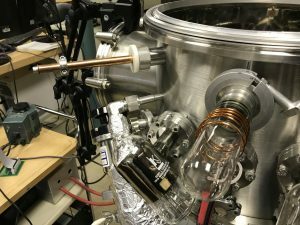 It has 2 permanent magnet rods (3/16″ dia x .5″) in the first part of the cup to act as a trap for incoming electrons and the cup can be positively biased to suppress secondary electrons so that the measured current is just the ion beam. 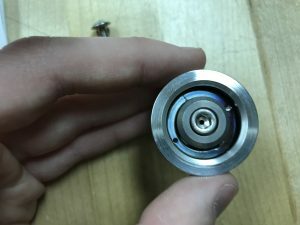 Between the section with the magnets and the collector, there is an interchangeable aperture so you can use different sizes. 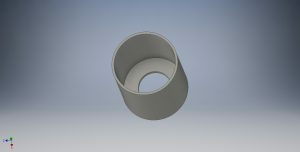 This was designed to be hand made on a lathe; there is no tolerancing so do not attempt to make it unmodified on a CNC. 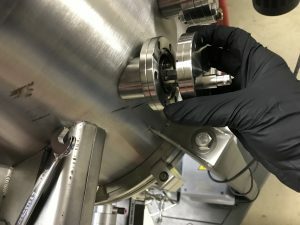 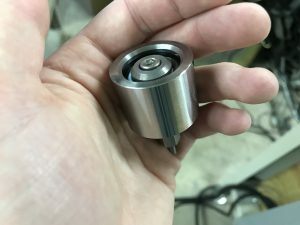 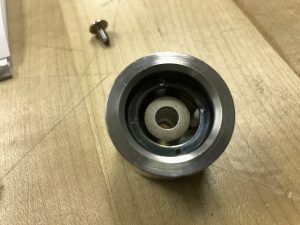 The body, aperture, and collector are made from stainless steel and the ring which holds the magnets and insulates the collector from the body is plastic (ideally PEEK). 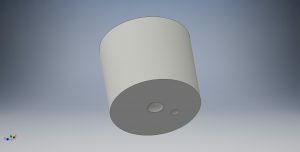 The backside of the cup has two blind holes, the center for mounting and the offset hole for BNC connection. 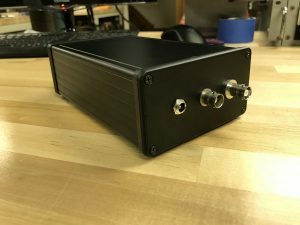 ALIS acquired from Andrew (http://rtftechnologies.org). 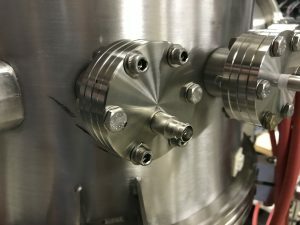 CF flange, MHV feedthrough, and HV PSU are on order. 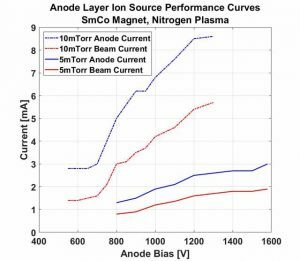 Abstract: Anode layer ion sources are one type of gridless (no acceleration or focusing grids/screens) closed-drift (electron and plasma movement is confined due to E x B force) ion sources and are therefore a simple way to make a confined ion/plasma stream. 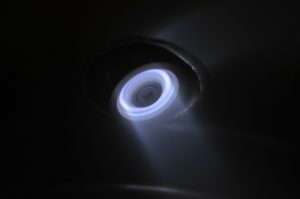 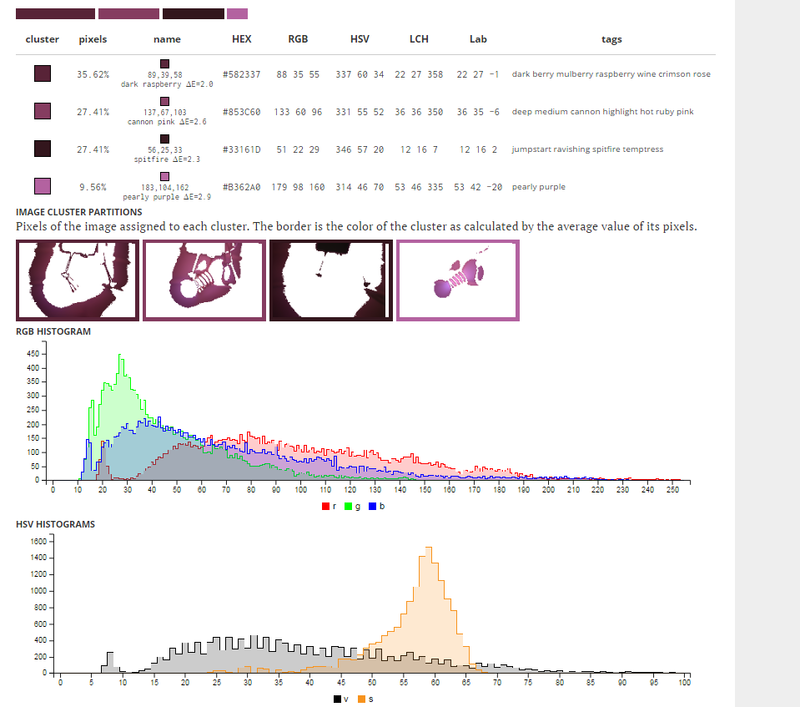 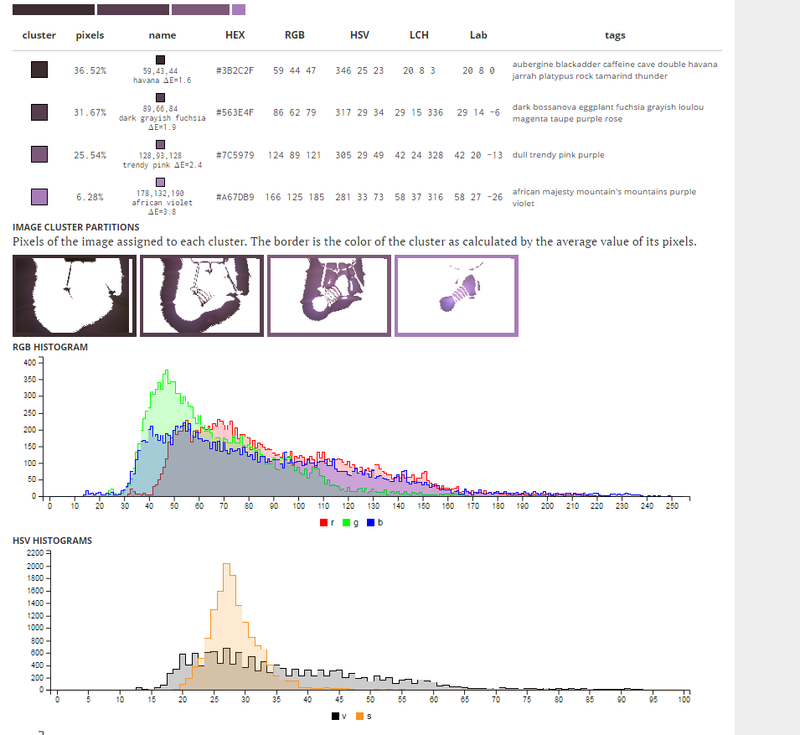 These sources commonly operate under partial vacuum in O2/N2/Ar environments. 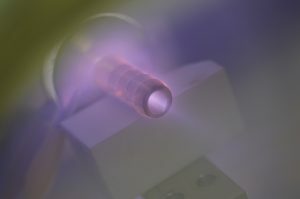 They have many applications, one of which is a high power directional plasma cleaning source which has many advantages over glow discharge or inductively/capacitively coupled plasmas. 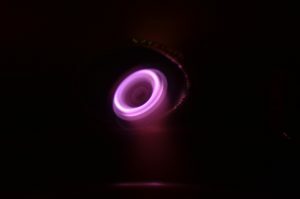 Their cylindrical geometry can be explained because it allows the E x B currents to converge and close in on themselves rather than being swept to one side in non-cylindrical designs. 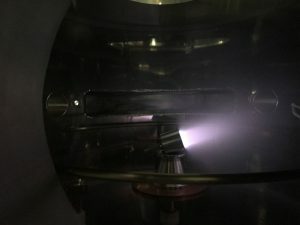 They are similar to inverted magnetrons and end-Hall ion thrusters in construction and in operation except they often do not require external neutralization for the ion beam.